To the consternation of many, the US government will no longer provide $350 million a year to the UN Relief and Works Agency for Palestine Refugees in the Near East (UNRWA), and the Trump administration says that it may cut more money for Palestinians in the West Bank and Gaza Strip. Some analysts and pundits claim that this decision will cause more hardship and violence in Gaza and the West Bank, and plunge other areas of the Middle East into unrest. This is unlikely to occur. The prophets of UNRWA's impending doom underestimate its political usefulness. UNRWA, which was founded in 1949, is simply too valuable a political asset to fail. Its existence guarantees that Palestinian refugees and the contested right of return remain a generational and prioritized political fixture in international fora. Consequently, Arab and other states use the demise of the Palestinians to generate political capital by lambasting Israel for its subjugation of the Palestinians, and for instigating a "humanitarian disaster" in the Gaza Strip. 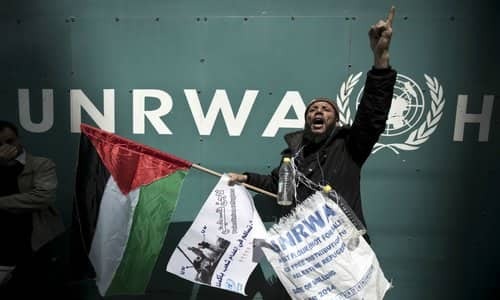 Much of UNRWA's and its backers' achievement in generating this political capital derives from their strategic interest to maintain the Palestinian right of return, and the Palestinian refugee, on the international political agenda. Former Commissioner-General to UNRWA Karen Abu-Zayed has stated that "Palestine refugees are the focus of the Agency's thinking, planning and activities. Promoting their interests as individuals with rights and entitlements under international law and ensuring their well-being and long-term human development are the engines that will continue to drive all aspects of UNRWA's activities." What is surprising is how UNRWA has ingeniously manipulated commonly accepted international humanitarian law and the 1951 UNHCR Convention definitions of a refugee. Why? Because by changing the definition of a Palestinian refugee, they have ensured that the Palestinian refugee issue can never be solved. This has turned UNRWA's original temporary relief mandate into a quasi-governmental and permanent political fixture in the West Bank and Gaza. More importantly, the definition ensures that the number of Palestinian refugees will continue to grow exponentially, and that they will remain under the auspices of UNRWA, and not the UNHCR -- which is responsible for every other group of refugees in the entire world. This situation led US State Department spokeswoman Heather Nauert to state that UNRWA's business model and fiscal practices were an "irredeemably flawed operation," and that the agency's "endlessly and exponentially expanding community of entitled beneficiaries is simply unsustainable." By manipulating the definition of refugee, UNRWA has succeeded in preserving its mission and making the refugee issue practically impossible to be solved by UNRWA alone. The Government of Israel (GOI) to contests the UNRWA definition of refugee, criticizing the partial and discriminate share of attention and services that they enjoy under the auspices of the UN: "They have their own set of rules, their own funding and of course, their own international agency -- UNRWA, and if this wasn't enough, their refugee status is transferred to their children." Furthermore, the GOI states, "it's worth noting that when UNRWA was established, its mandate included the task of resettling refugees. But the mandate was amended in 1965 to remove this important function. Today, many of the Palestinian refugees and their descendants do not live in refugee camps. Yet they continue to be counted as refugees by UNRWA and are receiving benefits including free health care and education." It also counts Palestinians settled in other countries as refugees. So even though the Agency keeps records of over five million Palestinians whom it "refers to" as Registered Refugees, this does not mean that under international law there actually are five million Palestine refugees. UNRWA will continue to justify its financial appeals by claiming that the refugee numbers will continue to grow. But this growth is inevitable considering the unique definition UNRWA has created around the term. If this term remains uncontested, UNRWA will continue to serve as a political springboard for those states who seem to be more interested in using UNRWA to keep the right of return on the international political agenda, than they are for meeting the humanitarian needs of their Palestinian beneficiaries.